Chai Masala, like nothing you ever tasted before! 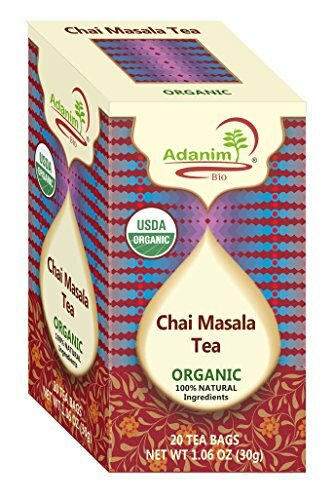 Our “Chai Masala” herbal tea blend is a great and easy way to enjoy a refreshing Chai any time of the day. A carefully selected Bombay tea blend with powerful flavor & aroma packed in individual Chai bags for long lasting freshness and flavor. Our Indian chai blend is an organic mix of tea leaves with powerful herbs and spices such as Cinnamon, Ginger, Clove and other body revitalizing herbs & seeds. A Dessert that is great for your body! Enjoy the amazing flavor of our Chai tea and revitalize your body! Our blend of Ginger, Clove & Cinnamon with other spices and herbs not only produces great flavor but is great for your body as well. Our Chai blend is rich in Antioxidants & vitamins which promote better digestion and oxygen levels. Adanim Bio started out as growers of organic medicinal herbs in the early 80s and since than evolved into a leading producer of high quality organic herbal tea sold to tea lovers worldwide. Thanks to years of experience and knowledge we are able to offer you a superior product that not only tastes great but also great for you! Join us in the magical world of tea and try our many great tasting blends designed for your exact needs. Premium Masala Bombay Chai Tea Packed in Individual Bags for long lasting freshness and flavor. Great for making both Hot & Iced Chai Spice Tea. Now you can enjoy Gourmet Chai rich in amazing Aroma & Flavors anytime you want! Did you know that one of the best ways to increase your daily Antioxidants intake is by drinking tea? Our Malasa Chai Tea mix is made from a handpicked Herbs & Spiced Chai Tea ingredients designed to nourish your body with powerful Antioxidants & Vitamins. Kosher & Certified Organic! We carefully select the VERY BEST Organic Chai Tea Ingredients from around the world and create our own unique Chai marsala blend in Israel! All Natural, No Artificial Color, Flavor & Sweeteners. Serve It as a Deliciously refreshing Dessert Tea - Blend a scope of Ice Cream together with a frozen Banana & Almond Milk and add 3/4 of brewed herbed chai tea with 1-2 ice cubes. If you have any questions about this product by Adanim Tea, contact us by completing and submitting the form below. If you are looking for a specif part number, please include it with your message.